Even the biggest, bravest adult male staring into the face of a huge lion would flinch and back away if said lion started pawing at him, despite a thick protective glass between them. But 3-year-old Sofia hardly batted an eye when a lion named Malik at the Wellington Zoo in New Zealand took a great interest in her, and then started pawing the glass. The video of the staredown between the little girl and the lion, easily won by the little girl, has gone viral, making the rounds on talk shows and throughout the blogosphere. 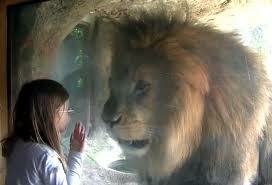 The little girl, dubbed Sofia the Lion Tamer, asks her mother what the lion is trying to tell her. "I think it's telling you to move away from there so he can eat his food," the mother responds. The mother is correct, actually. Three year old Sofia experienced a pretty close encounter through the glass at the viewing cave, which allows visitors a glimpse into just a portion of the lion’s exhibit. This behaviour is normal for a lion - they do tend to get very protective of their food which is why we feed our five lions separately from each other. The way Malik reacted to Sofia is a healthy reaction that lions in the wild would display. He was not displaying overt aggression towards Sophia – he was ‘politely’ telling her to go away. Luckily, we have a really lovely large exhibit for them, so rest assured that if Malik didn't want to be near the visitors, he could easily take his food somewhere else. There are areas where the lions can go to be out of the view of visitors if they choose. In a related wildlife video, see the bear that waves back to people in the link below.